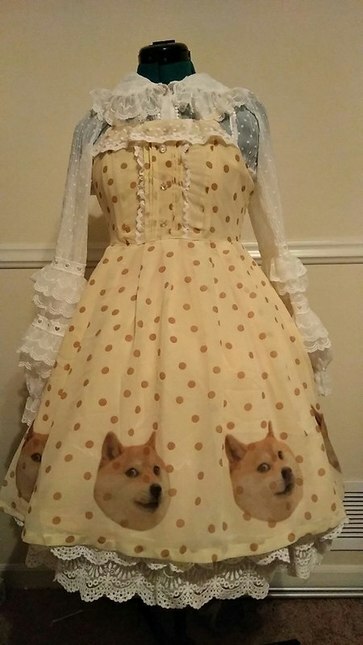 Forest Wardrobe is the new name for Dream of Alice, so this was made by the original Doge Dress brand and has the same taobao shop address. Never had a tag but is brand new, never tried on. I have the salopette also and I don't need both :) The tag says L but I think the actual size is better described as "this is the only size we are making this in" as the bust range is 82-100cm. 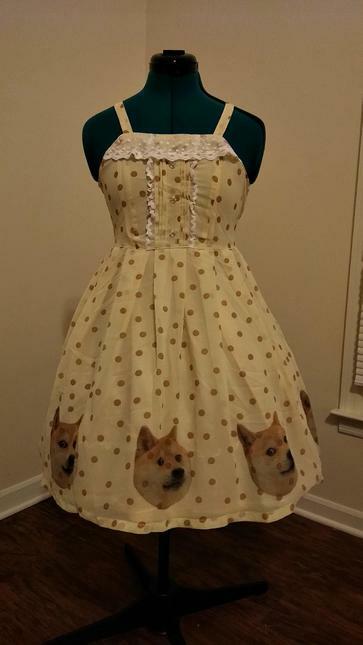 This was allegedly "B" stock, but the only potential errors I can find are that the doges are not evenly spaced out on the side seams (although the "A" stock might have been the same, I'm honestly not sure) and one of the buttons on the front chest placket is sewn through the lining instead of just the exterior fabric. Shirred back. I measure 90cm bust, so that is what my dressmakers dummy is set to measure as well. I've had it for a while but it's only been out of the plastic bag to take these pictures (it could probably use a steaming tbh). It has a pin-on brown bow also that has never been pinned on yet. Hello! How much would it cost to ship to 60004 illinois?